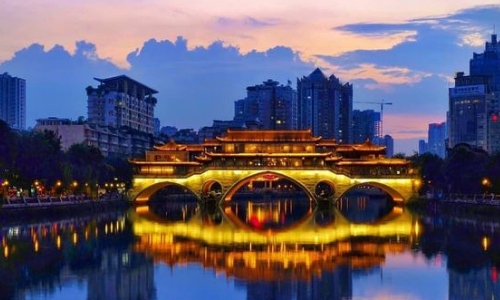 The Anshun Bridge (Chinese: 安顺桥) is a bridge in the provincial capital of Chengdu in Sichuan, China. Just likes its name, the bridge looks peaceful and propitious. The covered bridge contains a relatively large restaurant and is a popular eating location in the city. The bridge is especially beautiful to see at night. When it is lit up at night, it’s gorgeous. There is a lot of night activities with the bars and restaurants on both sides of the bridge. The restaurant on the North end is quite spectacular, and the Bar street is located on the Southern end of the bridge, so you can enjoy some nice Chinese cuisine and drink while you explore around the area. If you haven’t made your travel hit list for China yet, Anshun Bridge is a fantastic spot that you don’t want to miss.